Super Hero Boy: It's game day! Gaming fun for the kids! It's game day! Gaming fun for the kids! I've got some really awesome games to cover today so I figured I'd make a whole day of it! Especially seeing as last week was slow with me being sick we will be offering a bunch of giveaways to kick off the new week and my new found freedom from school that starts tomorrow. Hey nothing like a little celebration to get me into the holiday break spirit! First up on the schedule, one of my absolute favorite kids movie series of recent years has been made into a kids video game that the whole family will be clambering to play. Madagascar 2 Escape Africa is currently in theaters and sadly I have not seen it yet, however I have been playing it in my bedroom after Connor goes to sleep religiously for a week now and I can't seem to get enough of it. The game is part story part activity as for each part of the game you complete, which is broken down into mini games, a little more of the story is revealed. Currently I'm working on the "Welcome to Africa Chapter" and I'm rolling around Africa with Melman walking on a huge bolder attempting to close up steam vents. I have to admit for a kids game its super easy to play but its also just challenging enough that I'm not getting bored at all and parents will want to jump in and give it a try. Personally thus far my favorite level has been shooting Mort in a massive slingshot (poor Mort, he is my favorite after all) though I did feel a tad guilty when I shot him off the cliff on accident a few times. After all he does remind me slightly of Melos with those huge eyes. Once you've finished a chapter your rewarded with a bit of the story. The cut scenes are crisp and look like bits of the real movie and make for a great little breakup in the game play. Connor just likes to watch me play to catch the cut scenes, though I've yet to figure out how to explain to him that I can't just skip to the cut scenes. heh. Each chapter is single player though its pretty easy to play with the whole family as you can just rotate turns doing each of the little segments however the game includes quite a few mini games that can be played with several players. Though you do not choose which character in the game you will play during the adventure mode you will switch between each of the characters in the movie so no matter if you loved Glorida, Mort, Alex, Marty.. each of them have their own roles in the game. You can learn more about the game as well as play a demo and see some of the mini games on the Madagascar 2 Escape Africa The Game website! Madagascar 2 Escape Africa is currently available on Wii, Nintendo DS, Xbox 360, and PS3. You can pick them up at any major game retailer or on Amazon! I have three copies of Madagascar 2 Escape Africa to give away a a copy for the Nintendo DS, one for the Nintendo Wii and one for the Xbox 360. Talk about a kickoff to a slow week last week. Leave a comment on this post. Check out the Madagascar 2 Escape Africa The Game website and take a look at the mini games and tell me which one you'd most like to play! !Make sure to tell me if you need the Wii, DS or 360 version if you won. oooh! the kids are getting a Wii for Christmas - and this game looks like something they'd love. Of the mini-games, I think we'd like Monkey Match the best. I think my favorite mini game would be Monkey Match. We would have so much fun with this at Christmas. Thanks! Me and my son Tyler would love to play either Monkey Match or Penguin Capers for either the DS or Wii. Glu Mobile Demo looks super fun! We would need the Wii version if we are picked to be your lucky winners of this giveaway. Thanks for the awesome chance! We pretty much adore the Madagascar Penguins, so it's Penguin Capers for us. We a wii and a DS, though the family road trip we're planning in February means I'd favor the poratble DS version. Thanks! my nephrew would love the Monkey Match. I got him the wii last year for the hoildays. I think I'd like Monkey Match the best. If I won I'd need the Xbox 360 version please. Thanks! The monkey match sounds fun and would love it for the wii. I think I would like Monkey Match. My son would love to have this game either for the Wii or the XBOX 360. I would like to play penguin capers. Penquin Capers sounds like a really cute game. I'd love to enter for the Wii game. Thanks for this giveaway. Monkey Match looks really fun! In fact, they all do. Thanks for the great chance..
penguin capers looks funnest to me. we have a wii and xbox 360, so either prize would be great ! We have a Wii and I can tell this would be a great game for my kids. Thanks. We vote for penguin capers! I would love to try the Mini Golf and I know my son would really like Hot Durian. If I won, I'd love it on 360. Thanks! I added your blog to my sidebar. If I won, I'd love the Xbox 360 version. Thank you! This is my fifty year old sisters favourite movie. My grandaughter would love the Penguin Capers. I would love the X Box version. the monkey match sounds like fun! Monkey Match would be the best. I need 360. This is such a great giveaway...we would need the Nintendo DS version. And I think that Penguin Capers looks fun. I like the Penguin Capers. I have a Wii system at home. Penguin Capers for the Wii is my choice. The penguin capers looks like alot of fun. Thank you! penguin capers looks like fun! Glu Mobile Demo is something my son will like to see when he gets the chance on the comp. Penguin Capers looks like a lot of fun! We would need for the Wii. Thanks! Penguin Capers looks super fun!! I don't know, I'd let my grandkids decide if I won this. Penguin Capers. My daughter absolutely loves penguins. I'd love to win the Wii version. I would play the mini-game demo. The Wii version would be great! penquin capers for Wii sounds fun! Monkey match would probably be my kids choice. We are getting a Wii for Christmas and have a DS. Either platform would be great. My grandchildren and my favorite mini game would be Monkey Match. I think Penguin Capers would be a fun. Xbox 360 or Wii. Thanks! Volcano Rave looks like a lot of fun for the Wii. Thank you very much! Monkey Match looks like a lot of fun! We are getting the grandkids a Wii for Christmas so that would be the one I choose. My grandson would love Penguin Capers. Volcano Rave looks fun. And we would love the xbox 360 game! thanks. Penguin Capers looks like great fun to play on our Wii. 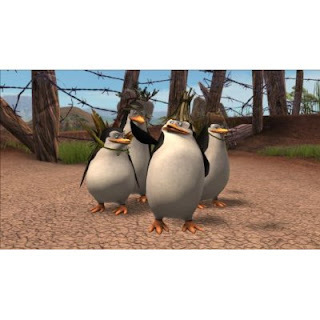 The penguins were the best part of the film. Thank you for the great give-away. Penguin Capers . . . Would love to win this for the Xbox 360. Penguin capers looks the best to me. I'd love a chance to win the Wii version. The mini golf game looks fun. I used to be a pinball fanatic when I was a teen, so I would probably like Mort's Pinball. I would love to get the 360 version! Penguin Capers is a game that I'd love to try! I'd prefer this for Wii, but for DS or PS3 would work too! Penguin capers would be a lot of fun! If I were to win, I'd like it for a 360-thanks! we'd like the Wii version. The monkey match mini game looks best to me! Monkey Match looks like it would be fun. If I win I would like the one for the WII please. Thanks. The Wii would be so awesome!!! THANKS! We have DS and my kids would love the penguin game. The Penguin Capers game looks very cute. But really the kids will have a great time playing all of them. penguin capers for wii would be fun!!! Monkey Match. By the time this giveaway is awarded, my daughters will likely have played through all the DS games they're getting for Christmas! I would play the volcoano rave on Wii. I like the mini game Penguin Capers!! Adorable!! We would need it for the Wii if we won!!! Penguin Capers. If I win I'd like it for DS! My kids would love Dolphin Capers! Thanks for the giveaway! I would love to win this. It's as close as I'll ever get to Africa. Thanks for the contest. Monkey match mini game for my pick. Happy Holidays. id say monkey match. adorable! my daughter would love this game for the Wii. Live the demos too cute.I like the Monkey Match and know my children would love playing this game. Would love to win the Wii game, thank-you and Merry Christmas everyone! I am a very happy subscriber too. Oh my Melman (the giraffe) is such a hoot, he has us in stitches watching this movie. Loved it! We would love to win the Nintendo DS Madagascar game, son just got a DS for Christmas and does not have many games to play. Surely he would enjoy this one. Thank you for the chance and Happy New Year Seven Dogs and A Baby, may 2009 be awesome for you. penguin capers looks great, love the Wii version! They look like game my son would love. I think he would really like Monkey Match. If we won I would like for Wii or xbox 360. If I'm lucky enough to win, I'd prefer the Wii version. Thanks. Penguin Capers looks fun. I'd choose the xbox 360 version of the game. Thanks for the fun giveaway! Monkey Match looks like it would be lots of fun. Prefer Nintendo DS, can also use Wii. First choice is DS, then Wii, the Xbox. Thanks. As far as first-person shooters my husband loves Halo 3, but for role-playing he and I both like the Neverwinter Nights 2 series. I'd enjoy Monkey Match on Wii. id like the Wii version. mini games i like are... Monkey match and Pengin capers! Hot Durian sounds fun. Wii please. Thanks! They boys got a Wii for Christmas, and they would love this game. The Penguin capers mini-games is one I know my 4 year old would really enjoy. Thanks for the great giveaway. The Penguin Capers game looks fun!! I'd need this for the Wii!! Thank you! Monkey Match for XBox 360 for us. 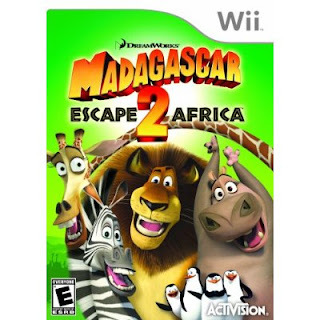 Madagascar 2: Escape Africa video game for the Nintendo Wii. Mini golf looks like it would be the funnest to play! If I am fortunate enough to win, I'd love the Wii version. Penguin Capers for Nintendo DS please. Monkey Match looks like fun. We have the DS. My kids would love this...thank you. I took my kids to this movie and they are now asking for the DVD when it comes out, they would enjoy the game also. Monkey Match looks like fun. We have a Wii. Monkey Match looks fun. Our Family got a 360 for x-mas and they would love this. the monkey match game looks like a lot of fun! we would need the wii version:) thanks! My favorite is Monkey Match! And we would prefer the Wii. For the Wii please. The monkey match looks fun. My favorite is Monkey Match, enter me please. Penguin Capers looks like fun! Would love to win the Wii game! My son and I would love to play either Monkey Match or Penguin Capers for Wii. My pick is Penguin Capers! Wii version Please. Rites of Passage is the mini-game I would like to play from Madagascar 2. If I win, please send the game for Wii.